Stallman, Richard M. (2002). GNU Emacs Manual (15th ed.). GNU Press. ISBN 1-882114-85-X. 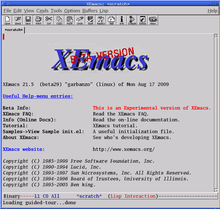 https://www.gnu.org/software/emacs/manual/. Chassel, Robert J. (2004). 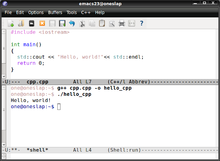 An Introduction to Programming in Emacs Lisp. GNU Press. ISBN 1-882114-56-6. https://www.gnu.org/software/emacs/emacs-lisp-intro/. Glickstein, Bob (April 1997). Writing GNU Emacs Extensions. O'Reilly & Associates. ISBN 1-56592-261-1. Cameron, Debra; Elliott, James; Loy, Marc; Raymond, Eric; Rosenblatt, Bill (December 2004). Learning GNU Emacs, 3rd Edition. O'Reilly & Associates. ISBN 0-596-00648-9. http://www.oreilly.com/catalog/gnu3/. Finseth, Craig A. (1991). The Craft of Text Editing -or- Emacs for the Modern World. Springer-Verlag & Co. ISBN 978-1-4116-8297-9. http://www.finseth.com/craft/. ^ Greenberg, Bernard S. (1979). Multics Emacs: The History, Design and Implementation. http://www.multicians.org/mepap.html 2016年6月12日閲覧。. ^ Raymond, Eric S.; Cameron, Debra; Rosenblatt, Bill (1996). Learning GNU Emacs, 2nd Edition. Sebastopol, CA: O'Reilly. pp. 408–409. ISBN 1-56592-152-6. https://books.google.com/books?id=a_lea3-w-1kC&pg=PA408&dq=bucky+keyboard#PPA408,M1. ^ Stallman, Richard M. (1987年). 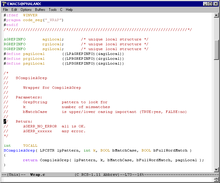 “The EMACS Full-Screen Editor”. GARB (Lysator, Linköping University) (Maj 1987): pp. 8–11. http://www.lysator.liu.se/history/garb/txt/87-1-emacs.txt 2007年9月14日閲覧。. ^ a b Stallman, Richard (1981年3月26日). EMACS: The Extensible, Customizable, Self-Documenting, Display Editor (技術レポート). MIT AI Lab. AI Memo 519a. http://dspace.mit.edu/bitstream/handle/1721.1/5736/AIM-519A.pdf 2011年1月7日閲覧。. ^ “Re: Looking for a new Emacs maintainer or team”. gnu.org Mailing List. 2008年2月23日閲覧。 ; see also "Stallman on handing over GNU Emacs, its future and the importance of nomenclature"
^ FrontPage - Meadow WikiArchived 2012-02-16 at the Wayback Machine.